Patient adherence to antiretroviral therapy (ART) is one of the most impor­tant factors associated with successful HIV outcomes. Following a diagnosis, timely entry into HIV medical care is essential to the provision of ART. However, of the approxi­mately 1.2 million people in the United States with HIV, only 69% are linked to care. For those who start care, only about 59% are retained in care. Among people with HIV who are on ART, just 28% have undetectable viral loads, which indicate high adherence to therapy. The varied and complex evidence base resulting from more than 20 years of research in these areas had until recently not been fully evaluated. 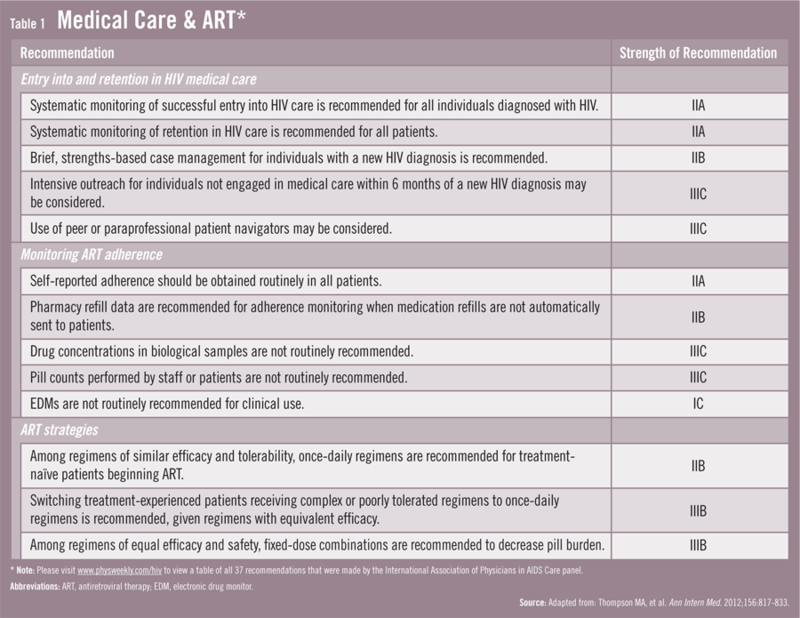 In an effort to improve entry and retention in care as well as ART adherence in patients with HIV, a guidelines committee sponsored by the International Association of Physicians in AIDS Care and the NIH Office of AIDS Research published evidence-based guidelines in the Annals of Internal Medicine. Click here to view the full guidelines. Melanie A. Thompson, MD, who was the lead author of the guideline document, says that the recommenda­tions set a high bar for meeting the standard of evidence. “We systematically reviewed literature from domestic and international studies that have been published since 1996,” she says. 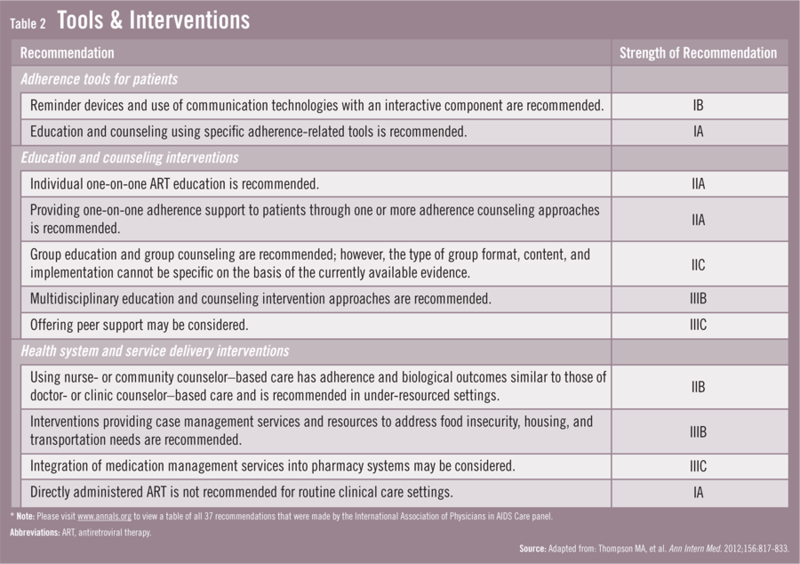 After reviewing 325 randomized controlled trials and observational studies that met stringent criteria for high-quality, comparative evidence, the expert panel arrived at 37 recommendations to assist clinicians in their care of people with HIV, several of which are particularly notable (Table 1). According to Dr. Thompson, the recommendation that entry into and retention in care be monitored may seem rather obvious. However, she notes that systems are generally not in place to monitor rates of successful entry once someone is diagnosed with HIV. She adds that systems monitoring retention in care once patients have been linked to it are also often lacking. Although they have shortcomings, adherence self-reports have been shown in research to be a valuable tool in the clinical setting for ART adherence, educa­tion, and counseling. “The guidelines recommend that self-reported adherence be obtained routinely in all patients with HIV,” says Dr. Thompson (Table 2). “In addition, all patients should receive some form of one-on-one ART education and adherence support.” Simple tools like pillboxes may be beneficial. In addi­tion, interactive text messaging reminders hold strong potential for improving adherence. It is important for physicians and caregivers to provide education and support for everyone. “The guidelines also recommend that patients be screened and treated for depression and other mental illnesses,” says Dr. Thompson. Depression, in particular, is a strong predictor of medication non-adherence. In addition, the guidelines provide recommendations for specific patient populations, including pregnant women, those with substance use disorders, those who are incar­cerated or homeless, and children and adolescents. Furthermore, several negative recommendations are provided. These advise against performing certain interventions because the evidence does not support their efficacy. One example of a negative recommen­dation is not having staff members in general clinical settings count pills. Another is that directly observed ART is not recommended for general clinic settings, although it may be helpful in people who are homeless or have substance use disorders. Thompson MA, Mugavero MJ, Amico KR, et al. Guidelines for improving entry into and retention in care and antiretroviral adherence for persons with HIV: evidence-based recommendations from an International Association of Physicians in AIDS Care panel. Ann Intern Med. 2012;156:817-833. Available at: www.annals.org/content/early/2012/03/05/0003-4819-156-11-201206050-00419.full. Thompson MA, Aberg JA, Cahn P, et al. Antiretroviral Treatment of Adult HIV Infection 2010 Recommendations of the International AIDS Society–USA Panel. JAMA. 2010;304:321-333. Available at: http://jama.ama-assn.org/cgi/content/abstract/304/3/321. Kitahata MM, Gange SJ, Abraham AG; et al, NA-ACCORD Investigators. Effect of early versus deferred antiretroviral therapy for HIV on survival. N Engl J Med. 2009;360:1815-1826. CDC. Vital signs: HIV prevention through care and treatment—United States. MMWR Morb Mortal Wkly Rep. 2011;60:1618-1623. World Health Organization. Antiretroviral therapy for HIV infection in adults and adolescents: recommendations for a public health approach, 2010 revision. Geneva, Switzerland. 2010. Available at: http://whqlibdoc.who.int/publications/2010/9789241599764_eng.pdf. U.S. Department of Health and Human Services.Guidelines for the use of antiretroviral agents in HIV-1-infected adults and adolescents. HHS Panel on Antiretroviral Guidelines for Adults and Adolescents—A Working Group of the Office of AIDS Research Advisory Council (OARAC). Washington, DC: U.S. Department of Health and Human Services; 2011. Available at: http://aidsinfo.nih.gov/guidelines/html/1/adult-and-adolescent-treatment-guidelines/0/. 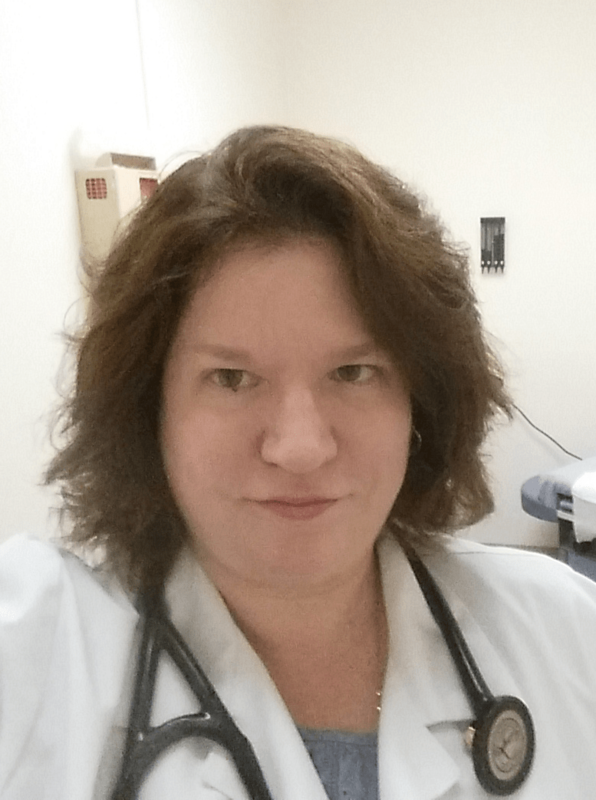 Melanie A. Thompson, MD, has indicated to Physician’s Weekly that she served as a consultant for and received support for travel to meetings from the International Association of Physicians in AIDS Care. She has received grant support from GlaxoSmithKline and Tibotec Therapeutics.